Shares of Pennar Engineered Building Systems and Shree Pushkar Chemicals & Fertilisers listed on BSE and NSE on an extremely weak note. Pennar Engineered Building Systems hit 5% circuit filter soon after listing at a discount to the issue price of INR178 per share. The stock was locked at in lower circuit of 5% at INR169.10 on the NSE soon after listing. Pennar Engineered Building Systems, a subsidiary of Pennar Industries Limited, barely scraped through with a subscription of 1.15 times. The pre-engineered buildings player raised INR46.8 crore by placing 26.32 lakh shares with anchor investors. In total, the company mobilized INR151.77 crore and offered exit route to existing investors including private equity player Zephyr Peacock, Ramani Potluri and Vikram Chachra. Out of the total INR58 crore from issue of fresh shares, INR34 crore will be used to lower interest costs by paying back loans while the rest will be used to purchase software and hardware and general corporate purposes. Listing performance of Shree Pushkar Chemicals & Fertilisers was relatively better but IPO investors did not make money in the stock. On the NSE, shares listed at INR60.05 and hit the upper circuit of 5% to INR63.05 soon. However, this was still down from the INR68 at which the company allotted shares in the IPO concluded last month. Shree Pushkar Chemicals & Fertilisers raised INR70 crore through a combination of fresh shares and an offer for sale. Unlike most other companies, Shree Pushkar Chemicals & Fertilisers did not engage anchor investors and its IPO received a total subscription of 1.33 times. The company, which produces a wide range of dye intermediates, cattle feed supplement and fertilizers, plans to use the funds for acquisition of a factory and setting up production and effluent treatment plants. The biggest chunk of IPO proceeds will be used towards setting up a new facility for production of reactive dyes, H-Acid, and Vinyl Sulphone. The company plans to invest INR41.6 crore in this regard while INR4.9 crore will be used towards establishing an effluent treatment plant at its existing facility. It is worth highlighting that both stocks are listed under ‘T’ group of securities which restrict a single day movement to 5% on either side. Poor listing of these IPOs is intriguing as both companies have stable and growing businesses and received positive reviews from analysts. 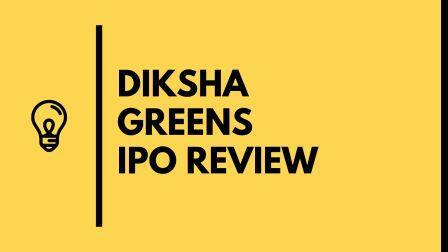 Diksha Greens IPO Review: Should you invest?